Thom S. Rainer who is CEO of Lifeway Christian Resources, Church consultant and author of numerous books recently conducted a poll asking church leaders to share excuses they’ve heard from people who choose not to attend church. Some of the responses were common (hypocrites at church, worshipping on the lake or golf course, pastor preaches too long or short, etc.). However, the following are 15 of the best excuses church leaders shared with him. It is easy to find a reason to not attend worship on Sunday. Most of these reasons are silly and quite humorous, however, I’m convinced that if we stop and consider who is inviting us to gather for worship our perspective will change. It is not the pastor who is inviting you to gather on Sunday morning, it is the Lord of Creation, it is God Himself who is inviting you to join Him in His presence. If we have this perspective then almost every excuse seems silly. Don’t miss the invitation to gather as the Body of Christ and worship the Living God in His presence. It is a blessing. Tonight, the Youth group is meeting at the church at 6:30 for a movie night. 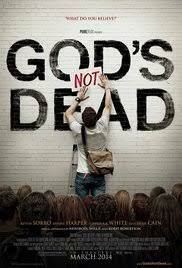 They will be showing God’s Not Dead. On June 21st at 7PM we will have a worship service at the church instead of our home Bible studies. June 22-28th in Indianapolis, Indiana. Every four years, more than 20,000 Nazarenes from around the world gather for General Assembly and Conventions. This global family reunion includes times of worship, service, fellowship, training, and making important decisions that will affect future generations of Nazarenes. Pastor Andy is a delegate representing the Kansas District so Pastor Eva will be preaching June 25th. Pray for our church and the decisions that are being made at this assembly. The cost is $170 per camper if received by July 2nd, 2017. If you are interested in attending camp please see Stephanie Heer or Claudia Romero.